Colours SO delicious, you could EAT them! Mentors, Messengers, Mystics and Muses – meet the Troupe of the Chrysalis Tarot. Holly Sierra, the artist behind this soon-to-be released Tarot, chats about the deck. Pull up a throne and feast your eyes, people! Hi Holly and thanks for agreeing to answer my questions! First of all, can you tell me a little about where you are – just to help set the scene a little? Now then, tell me a little bit about your Tarot background – just how you got into Tarot? And what made you decide to create THIS Tarot deck? ‘The Chrysalis Tarot Deck is the first I have created but will certainly not be the last…It took me two and a half years to complete all the paintings for this deck and doing so, I was really realising a dream! ‘The wonderful thing about creating a deck and recording the process through social media is that I have gained so many lovely followers from all over the world. Chrysalis has been just that – An awakening for my spirit! It has helped me make friends all over the world!!! What’s the theme or ethos behind this deck? I’ve only seen the court cards and it looks wonderfully romantic and fairytale like! ‘Chrysalis Tarot is wonderfully romantic and magical… This is exactly the feeling I like in other deck’s art and wanted to achieve in my own. Our deck is about achieving your destiny through a life filled with chance, chicanery and choice. The pursuit of personal destiny is a struggle to find inner peace, to find balance between an ego that wants and takes and a psyche that allows and gives. By your side on your quest for self-fulfillment is an unseen force. It’s an energy field known by many names and recognized by many masks; a force that informs your psyche and nudges you forward. At Chrysalis, we refer to this force as the Otherworld. It’s also known as The Ground of All Being, the Collective Unconscious and the Universal Mind. I find the colours vibrant and quite delicious – which seems to run through all your work! How would you describe your cards to someone that hasn’t seen your work before? ‘Although I don’t feel ‘especially’ colourful when I work on one particular piece of art, I do find that when seen altogether, my paintings are quite vibrant and very colourful!! I love the range that’s possible when creating a ‘series of work’ and I was very interested in colour-coding this deck for easier use. Tell me about the composition of your deck. For example – what’s the Strength/Justice positions? Have you renamed any of the Major Arcana? Do you have 22 Majors? Anything about your Major Arcana that’s a bit different to other decks out there? The Chrysalis Tarot does have the same number of cards as a traditional Tarot Deck. Many of our Majors differ but when it came to the Sun and Moon, we followed the traditional path, though with slightly altered meanings. Sadly, US Games only provides a small booklet with most of their decks so it was hard for the author Toney Brooks to expound much on his creations. Will you create a larger accompanying book to allow Toney to wax lyrical? Tell me about the Minor Arcana cards and the associations that you have created for them? And about the Courts, of course! ‘So here is how the colour associations fall out for the Minor Arcana (Pips). The 16 card Troupe also follows this pattern. Four of the Troupe members are of the Mirror Suit, Four are of the Spiral Suit, Four of the Scrolls Suit and Four of the Stone Suit. Stones represent the element of Earth, matter and material consciousness. The suit’s highest values are material happiness and prosperity. Stone pips help you identify specific material or physical values exerting influence upon your reading – values that can be desirable or undesirable. attributes of Mirrors are feelings and emotions. The suit’s highest values are nourishment and love. The Mirror pips accentuate the values of self-examination and self-awareness. The Chrysalis Tarot Spirals represent the element of Fire and rational thinking. The specific attribute of the Suit of Spirals is Energy. The suit’s highest values are passion and personal growth. Scrolls represent the element of Air and the intellect. The specific attribute of the Suit of Scrolls is Intuition, which is the suit’s highest value. Scrolls are truth-bearing cards pointing to clarity of thought. 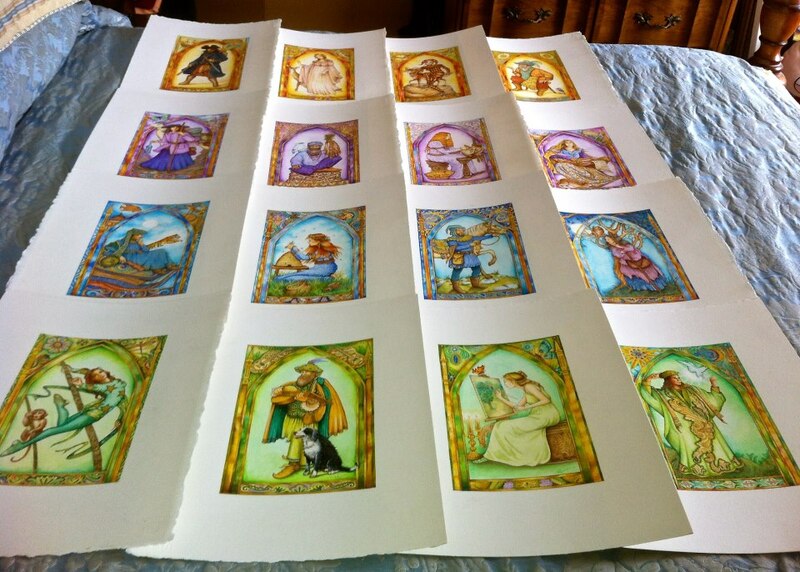 The sixteen court cards (The Troupe) look wonderful – tell me about them! What are the ranks that you have chosen for them? How do they relate to each other within the suit and across the other suits? I see that each character has an animal with them in their card – tell me about these animals! Without going into too much detail, I will relay what Toney Brooks says about the Troupe, for it is his creation and I LOVE it. As the artist, I interpreted each character visually and decided which animal companion would be accompanying each on his (or her) journey. I made this judgment based on what I felt from each and if position in life or trade, legend or history allowed, such as in the Pirate’s case, I acted accordingly! ‘The Chrysalis Troupe is a delightful ensemble of medieval merrymakers. Unlike archetypes, the Troupe’s characters stand in for real-world people and personality types from your past, present or future. They may be family, friends, acquaintances, or even total strangers. You attract them naturally via compatible energy signatures. Using synchronicity, the Otherworld places these characters in your path to be mentors, messengers, mystics and muses. ‘This much is true with all spiritual quests: you never walk alone. We humans are interdependent; you meet those you are destined to meet. Our Troupe corresponds to traditional tarot court cards like King of Pentacles, Queen of Cups, and so forth. There’s an equal number of male and female characters in the Troupe. However, in real life these characters can appear as men or women of any age. To avoid confusion, card descriptions refer to the gender of the character portrayed. Tell me about your deck’s equivalent of the Page of Swords, Holly? Our Deck’s Page Of Swords is the Pilgrim whose attributes are perseverance and endurance. His role is that of the messenger. 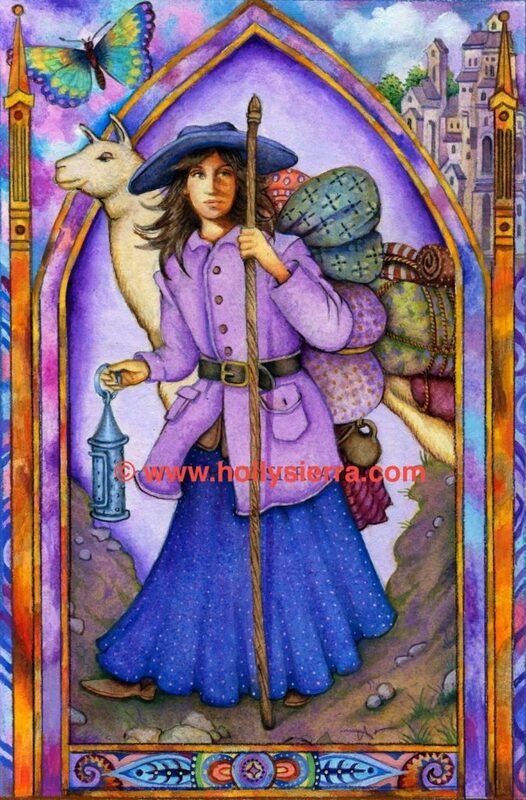 The Pilgrim’s llama symbolizes inner peace that comes from waving goodbye to creature comforts and the security of home, at least for awhile. The distance a pilgrim travels matters not – the essence of the pilgrim’s true journey is interior self-discovery. The Pilgrim symbolizes ascendancy, the primary benefit of pilgrimage. The word ascendancy combines the essence of spiritual transformation with self-fulfillment. It’s the castle you leave behind to pursue the exotic butterfly. This card foretells very positive changes taking place in your life. Tell me about your creative process! I painted the cards proportionally according to standards I’d researched for Tarot Card publishing companies. Each original painting is 6 x 9 inches and is painted in acrylics on Arches 300 lb test watercolour board. I use the acrylics much as one would watercolours with a lot of water and thin layers. The difference with acrylics is that the previous layer doesn’t ‘pick up’ so I can continue layering effects. They Troupe paintings are quite lovely when lain out altogether on my bed…Unfortunately I can only fit about 16 pieces at a showing. I have included a photo of them all. How will people be able to get a hold of your new deck and when will it be available?! The Chrysalis Tarot deck is with US Games right now, undergoing editing and layout processes. Upon our approval, it will then be sent to Asia (most likely) for printing and is expected to be available to the public next spring!!! I hope Chrysalis will bring a little magic and beauty to all who have awaited its arrival!! I know I get so excited when a deck that I have been anxious for finally materializes. And for all those who are interested~ I will be selling special autographed copies of the deck when it’s ready. I must say it will be a very exciting and rewarding time when we finally see Chrysalis in print!!! A wonderful interview! Thanks so much, Alison! Beautiful! Thank you for the interview and for heads up on the deck Ali! It's not for me, but the colours are pretty. It's nice to see interviews with tarot artists. Thanks, Alison.